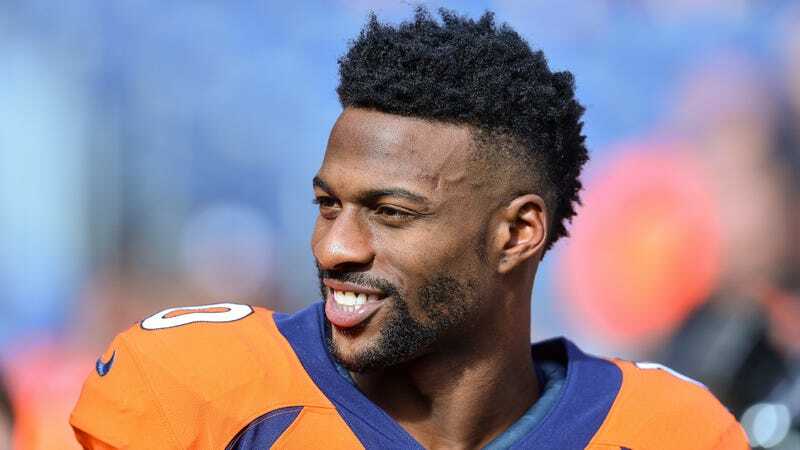 Last week, a grand jury in Harris County, Texas declined to indict Denver Broncos wide receiver Emmanuel Sanders on a charge of sexual assault, according to online court records. Sanders had been accused of sexual assault back in the summer, but the investigation was not public knowledge until Thursday, when TMZ reported that the grand jury had decided not to indict him. According to the Harris County Sheriff’s official statement, they received a complaint on June 15 about Emmanuel Sanders. The sheriff’s office doesn’t specify the nature of the complaint, but online court records show that the charge presented was sexual assault. The statement says that Sanders was interviewed as part of the investigation, and that on Jan. 9, the grand jury decided that there was not enough evidence to charge Sanders. The Denver Broncos released a statement saying they are “looking into” the report. Deadspin has submitted a request for the incident report. However a spokesperson for the sheriff’s office told Deadspin that, under Texas law, they were not releasing it because the investigation did not result in a conviction. Staff writer Emma Baccellieri contributed to this report.